Cameron Carmichael believes the successful partnership with our clients is built on a foundation of mutual dedication, trust and commitment to outstanding results. We get to know you on an operational, intellectual and personal level. By taking the time to dive deep on who you are, the intricacies of your business and your corporate culture, we build mutual trust while gaining an in-depth understanding of your unique needs. Functioning as active members of your team, we help define your executive positions and their ideal qualifications, then proactively engage the top talent in the marketplace. Our candidate assessment and recruitment process is proven and our results guaranteed. Our three stage search process is consistently evaluated, measured and refined to ensure that it remains one of the highest quality, verifiable processes in the executive search industry. Cameron Carmichael believes that our success begins by thoroughly understanding your unique needs. By engaging the proper mix of key stakeholders and clearly defining the role, we can deeply appreciate the unique professional and cultural requirements needed by your organization. The bedrock of our relationship with you begins in this stage. Our objective is to become a trusted partner and high value representative for your organization within the marketplace. We will lead a proactive effort to source, assess and present only the top talent that meets your unique needs. It is our primary responsibility to identify, develop and help you recruit leaders who you could not otherwise access. 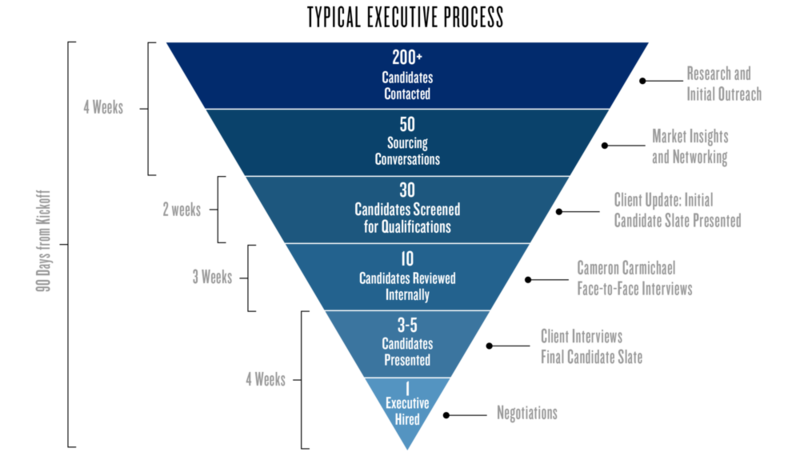 We will thoroughly screen and verify all finalists through a proprietary interview methodology that includes qualification assessment, behavioral based interviews, as well as complete background and reference checks – the results of which will be compiled and presented to you in detailed and instructional written presentations, allowing you to focus your time and attention on determining your candidate of choice. Cameron Carmichael believes that securing your candidate of choice is only the beginning of a truly successful search. Ultimately, the candidate’s performance is our measure of value. By facilitating a clear process for integrating the successful candidate into the position, organization and community, we accelerate performance and help you start to realize return on your investment.